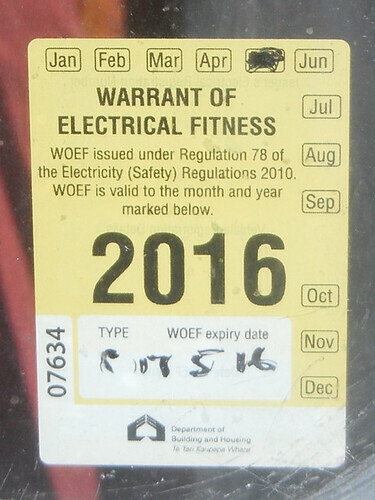 Every thing that is connected to the electrical grid in New Zealand, be it a building or a yacht, needs an electrical warrant of fitness. On the face of it, this is a good idea. I’m all for safety first. Like many things, the grand idea was lost in the implementation. Electricity supply in New Zealand start out vastly safer than it is in the Americas. Every place where you can plug in has two safety devices. The first is an ordinary breaker, which prevents excessive power draw which stops short circuits, and anything else, from starting an electrical fire. The second is a Residual Current Detector, which makes sure that all of the power going out comes back. This prevents electricity from “leaking” into anything, which is mostly a concern as this is electrician speak for electrocution, amongst other things. So we take a boat, which is self evidentially already a safe electrical installation as it worked for years overseas, and we plug it into a doubly protected power supply. Then the regulations insist that we certify that the cable connecting the boat to the dock is safe and proper. All good. Then the regulations insist that we replicate the same two safety devices that are on the other side of the certified cable on the boat. Which quite frankly is where all sense went out of the process. When connecting a 110v boat to New Zealand power you have three options. You can wire a parallel 220v system and buy local appliances. You can buy a transformer and power your 110v from it. 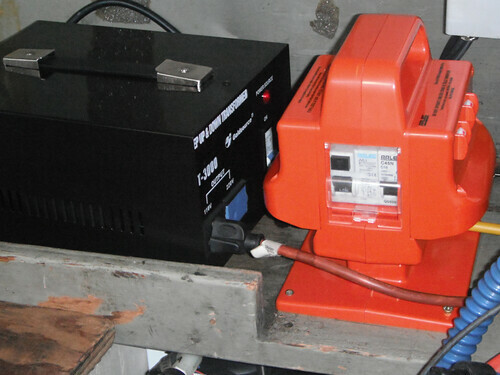 Or you can connect a battery charger to the 220v and run your inverter to get 110v. If your power desires are small, say 1 KW or so, then the battery charger option is probably most sensible. If your power desires are large then buying 220v appliances is probably the right way. We think we want 2-3 KW and decided to get a transformer. The orange device on the right is a portable power point, designed for outdoor work places like construction sites. It is wired directly to our New Zealand shore power cable. It then plugs into the device on the left, which is a 3 KW step up and down transformer, which takes the local 220v 50Hz A/C and converts it to 110v 50Hz A/C. Our devices want North American standard 110v A/C at 60Hz, but so far everything is running smoothly on 50Hz power. Like pretty much anything involving small foreign craft in New Zealand, we should have done all of this in Whangarei. The further a visiting yacht gets from Whangarei the less the locals understand you. We could have had Darusha’s uncle do our installation in Auckland. But we thought that our friends in Wellington could set us up and inspect us for our WOF. It turns out that our friend doesn’t have his inspector’s ticket. I would also highly recommend bringing whatever equipment that you need from the Americas, as all electrical equipment is unreasonably expensive in New Zealand. If you find yourself here and need something, you should buy it online. Not only was our local supplier several times more expensive than buying online, but shipping from Auckland to Wellington was almost the same price as shipping from the US to Wellington would have been. The transformer was $325. Similar models are about US$150 online. The powerpoint was $130. We were quoted prices up to double that for very similar items by other local suppliers. The shore power cable was $60. half of Japan’s power is on 50 Hz, half on 60 Hz, now that is crazy!! you might need that transformer in Europe and other parts of the world. with 220 V (and salt water) is is good to have greater safety than here in North America. strange that world class sail boats like yours are not built with power supplies that work and cope with much of the world power supplies in countries worth visiting. yes, I agree, it all seems crazy and excessive. then again the logic that just because your boat has been operating well for years is not the same as it being safe.